Give your floor and furniture the best protection with this 90 x 120 x 0.2cm PVC Home-use Protective Mat for Floor Chair. It will bring your life a lot of benefits. This mat can effectively block the surface of objects and reduce the scratches when your furniture is moving on the floor. Superior PVC material makes it durable and reliable for long-lasting use. The reasonable price is suitable for each clever shopper who focuses on quality and price. All in all, with this protective pad, you will be effectively protected from slipping while sitting on a chair! 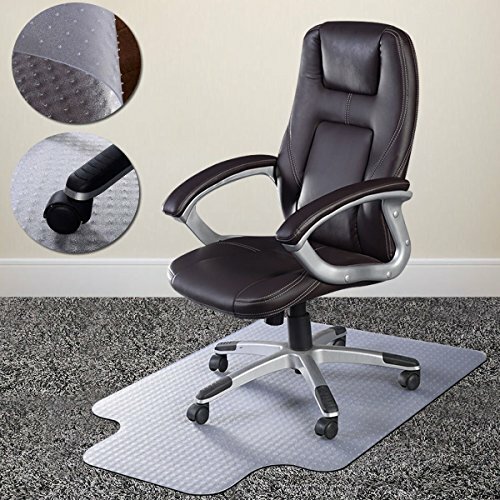 The unique surface texture allows your office chair to move easily while carrying out daily tasks, but has enough grip to maintain controlled rolling so the chair doesn't skid around. Ease of rolling between tasks promotes ergonomic posture and helps to considerably reduce the risk of leg fatigue. If there are ever any spills, simply wipe it with a soapy dishcloth.Under standard use, it will not crack, curl, break, scratch or discolor. If you have any problem, please feel free to contact us, your satisfiction is our best wish. If you have any questions about this product by Azadx, contact us by completing and submitting the form below. If you are looking for a specif part number, please include it with your message.